These Instructions Are Just the Start. Let Your Imagination Run Wild! These directions seem and sound complicated, but the project is really simple and fun to do. In fact, you can complete it in less than an hour. While there are specific instructions included, there is no limit to the materials you can use to decorate your birdhouse. A natural look is great, but you can also use pieces of china or glass, beads, buttons, or even paper to create a unique look that goes with your decor! Start by creating a flat platform for the bottom of the birdhouse. You can do this by gluing craft sticks into a simple square frame and then gluing more craft sticks to the frame. Alternatively, you can simply grab a piece of cardboard, wood, or cork to make a sturdy bottom. Glue craft sticks on top of one another to form the four sides of the birdhouse. Choose one side to be the front of the birdhouse. Use a circular craft punch to make a hole in the center; this will be the "entrance" to your birdhouse. Choose a color and paint all the sides and the base with tempera paint. Be creative! The birdhouse in the picture is painted a natural-looking brown, but any color or color combination is just fine. Paint the clothespins the same or a contrasting color. When the paint has dried, glue the sides to the already-prepared base. Pull four clothespins apart and glue them into a v shape to form the roof. Glue the flat bottom part of the clothes pin to the top part of the popsicle sticks and angle it to form the v and keep doing that until you have the roof made. Once your basic birdhouse is complete, it's time to go out into your yard or a nearby park to gather pine cones, branches, and other natural items. Some possibilities include twigs, grasses, bark, acorns, seed pods, or berries. 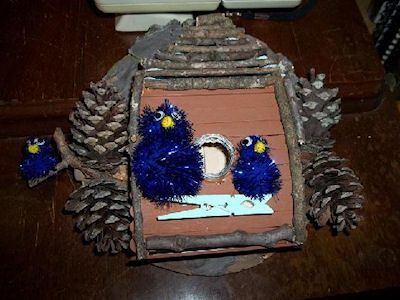 Cut your natural items to an appropriate size for your birdhouse, and glue them onto the roof and sides. You can use these items in two ways -- first, to create a fun, natural look and, second, to hide any gaps between your craft sticks! Glue your fifth and last clothespin horizontally under the circular opening in your birdhouse. This is a perch for your pom-pom birds to sit on. You can use different sizes of pom-poms to make a mama, papa and baby bird. Simply glue a smaller pompom on top of a larger pompom of the same color to create the basic bird shape. Then glue on small wiggle eyes and a little bitty pom-pom for the beak. Finally, glue the birds to the birdhouse. The pine cones in the birdhouse pictured had the perfect little branch sticking out, so it made sense to put the baby blue bird on it to make it look like he was ready to learn to fly.